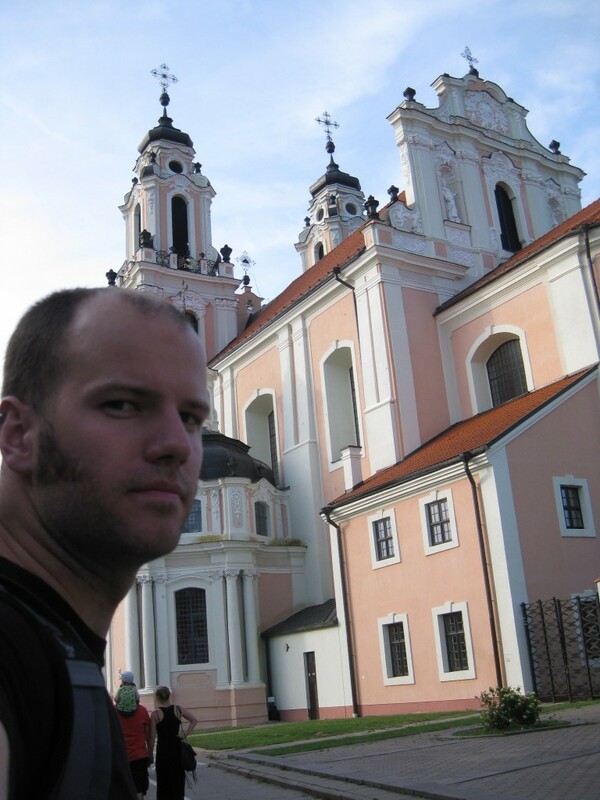 Vilnius was like I expected it to be, beautiful but quite boring. Being a student city, most of the action happens during the school year. 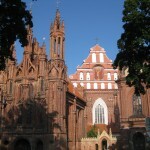 Interestingly, the city had an unreasonable number of churches; around forty the guide said. The skyline was peppered with them and they all had something different which allows me to guess they used to all cater to specific purpose of religion. 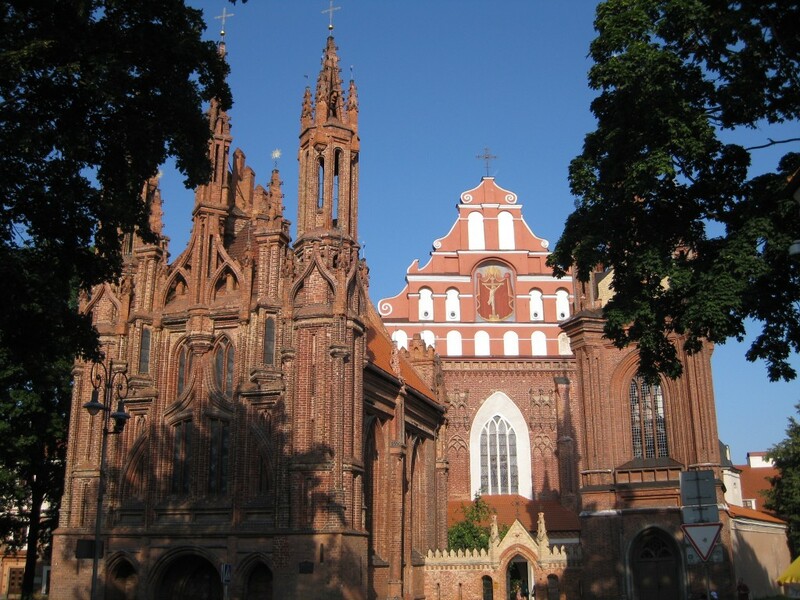 I wanted to see the inside of an Otrhodox church in Riga but did not get to because I was wearing shorts! 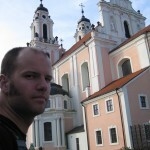 I had another chance to visit one in Vilnius but it was already too late when I found it. The rest will mostly be weather related because that was all my day was about. I had been lucky so far and only got rained on a couple of times; it was never very serious too. This time, my luck ran out, I woke up and it was already pouring outside. 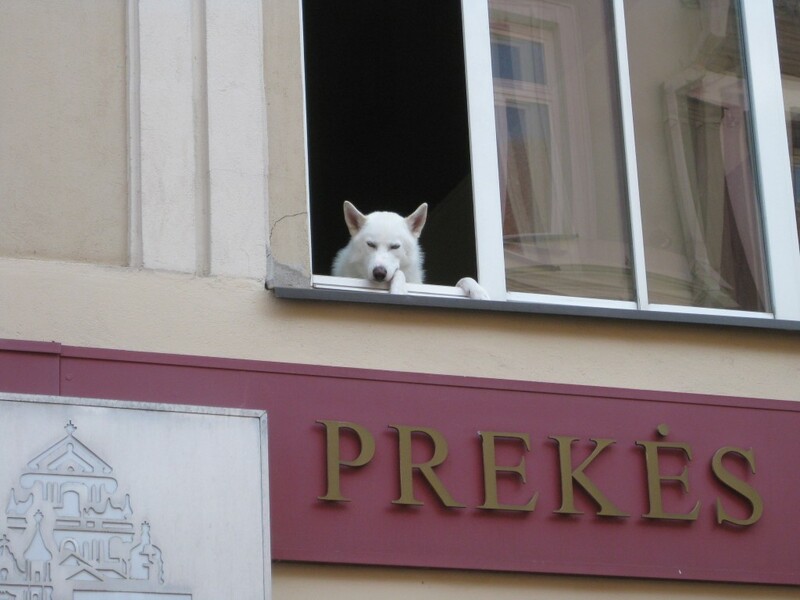 Someone asked the receptionist at the hostel to call a cab and later came to cancel because it had died down. So I took the opportunity and jumped on the bike but as soon as I got going, it started raining really hard. In no time, my feet were soaked and I could feel water dripping down my pants and my back, turns out that my jacket is poorly conceived and leaks at the front zipper. After 20 kms, I was getting really cold so I decided to stop and put more layers on, another shirt and the emergency poncho that I had stowed away under the seat. Not enough it seems because 15 minutes later, I started shivering. I wanted to find a dry spot to change but had just entered a national park. To make matters worse, I was again sharing the road with a bunch of trucks which means I could not really slow down without them passing me and soaking me with their trailing mist. A very dangerous situation but at last, there was a small café (khaviné in lithuanian) so I stopped there, rushed inside and ordered something to warm myself up. This really got me reconsidering today’s voyage and was about to ask the waitress at the café directions for the nearest hotel when the sky started clearing up. After a while, the raining had lessened a lot and I could see patches of sunlight on the horizon. It was still raining tough and the weather forecast said intermittent rain so I got dressed up even more. I put on an extra pair of pants, got rid of my wet stocks, put on two fresh pairs and some plastic bags to waterproof my feet and hit the road again. I managed to go for about an hundred kilometers before the weather decided to jeoparsize my security again but it was not the rain or the cold this time, it was the wind. Near the Polish border it got so windy and gusty that I got pushed into the oncoming lane several times. I decided to stop but once again could not so I pulled to the very small shoulder with a flasher on and slowly made my way to the closest exit. This part was probably where it got the scariest in the whole trip. There is only one road that links Poland to the Baltic countries and believe me there are more vans than cars making the crossing. To make matters worse, the E68 as it is called is only two lanes wide and polish drivers not being much more competent or concerned with safety than their baltic counterparts kept passing me very close and even if there was an oncoming vehicle. Nevertheless, the wind eventually diminished and the road soon started going westward so I got going again. A bit further down, all the trees were mangled with many of them uprooted or simply broken; this must have been the doings of a storm but since all the debris had been swept away to the side, it must probably not too long ago altough not today; which goes to say that this region is quite windy. The rest of the trip was mixed bag of what I had gotten so far with increasingly more sun as I was nearing my destionation. The land being really flat, I could see rainy clouds from far away and would just stop and let them pass, which also explains why the route took a very long time. Finally, I made it in one piece to Warsaw. The city being a capital, I will be spending two days here and then on to Berlin. Odd church specimen number 36. Odd church specimen number 21. 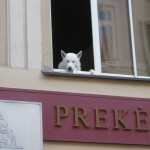 This dog was watching passers by in the Vilnius old town. Félicitations pour la photo du chien qui m’a fait sourire!